The Adult Social Care Annual Report identifies current issues and priorities (https://new.devon.gov.uk/adultsocialcareandhealth/guide/adult-social-care-in-devon-2014-annual-report/). 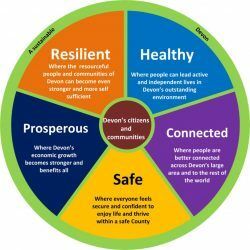 Further to this, the vision for care and support for vulnerable adults in Devon sets out how the County Council, its partners and the citizens of Devon will work together to build supportive communities and independent individuals. A Sustainability and Transformation Plan (STP) is currently in development to inform the work of the NHS in Devon, Plymouth and Torbay to provide a vision of better health, patient care and improved NHS efficiency. Current strategic plans are outlined below.